Doubt is not the same as unbelief, but if we don’t wrestle with our doubts wisely they can lead to unbelief. John Stevens, National Director of the Fellowship of Independent Evangelical Churches in the UK, wants to help Christians wrestle well with their doubts. In How Can I Be Sure? he seeks to answer five common questions surrounding doubt. While there are many books that explore the exegetical and theological foundations of assurance of salvation, the strength of this little volume is its pastoral heart. The book works best as a simple guide to navigating doubts that go deeper than simple intellectual challenges to the faith. As part of the Questions Christians Ask series from The Good Book Company, this volume carries the same general philosophy as the other volumes. Provide readers with a short, readable book that aims to provide practical help in navigating theological truth. Stevens begins with what seems like an obvious question, “what is doubt”. But his answer reveals the variety of ways in which we can use this terminology. He notes, then, an important distinction we need to make as we prepare to talk about assurance of salvation: there is good doubt and dangerous doubt. This is a distinction far too infrequently discussed. 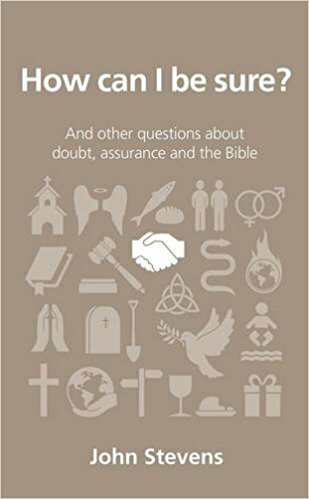 Barnabas Piper and Matthew Lee Anderson each mention this distinction in their respective works on doubt and faith, but rarely does it get talked about at the pastoral level. Stevens provides encouragement to discuss doubt with mature believers and encourages us with the ubiquity of the experience. Doubt is a normal, and can even sometimes be a healthy, experience for all believers. The point at which it becomes dangerous, however, is important to note too. Chapter two, then, directs readers to consider carefully the potential dangers of prolonged doubt. It is highly popular to discuss doubt as an act of “humility” and to suggest that it should be honored. The temptation can be to miss the real threat that doubt can present to believers if it is not wrestled with wisely and with Scripture. On this last point, Stevens is strong. When he seeks to address the issue of assurance he turns readers to the book of 1 John and walks us through 1 John 5:1-13 to give us a framework for drawing biblical conclusions about our salvation. The goal is to have an objective standard to which we can appeal, not simply a subjective feeling – though he does willingly acknowledge the role of the Holy Spirit in confirming our experience. His exposition is simple and accessible but without being simplistic. He offers hope grounded in the Scriptures, but also takes the time to acknowledge some of the lingering questions that readers will undoubtedly have, like: What about friends who fall away? How can I be sure my faith is genuine? What if I don’t “feel” God’s presence? What if God doesn’t love me back? If God gives faith why do I still have doubts? The book’s accessibility never diminishes the weight of these very real questions. Finally, chapters four and five wrestle with overcoming doubt and cultivating deeper faith. If on the one hand we can do things to help us fight faith, it is always better to work more on the prevention of doubt. So, here Stevens encourages readers to do both. Wrestle with doubt and seek to overcome it, while also growing more confident in faith. The book’s practical helps really shine in these two chapters. This is a great resource. While more exegetical and theological tools are needed to add weight to the conclusions of this book, Stevens acknowledges that most doubt isn’t rooted in purely cognitive reasoning. Doubt arises from several different sources and this book aims its sights primarily on the causes behind intellectual challenges to the faith. This is not an apologetic tool but a pastoral tool. Accompanied by some of the other weighty works, like Storms’ Kept for Jesus, this book will be a tremendous blessing to Christians. I recommend How Can I Be Sure? for those Christians whose faith is struggling for reasons other than intellectual arguments. I recommend it to all pastors as a great example of how to care for those who doubt.